Week 2 Highlights: Lowell, Seaside, Ed Sias, and More! Lauren Peurifoy (King) is THE biggest story of the 2015 season so far! After running a best of 19:15 as a freshman last fall, she opened with a 16:59 at Cool Breeze last week, and this weekend she won her Varsity Girls race at the Lowell Invitational in 17:08.2. 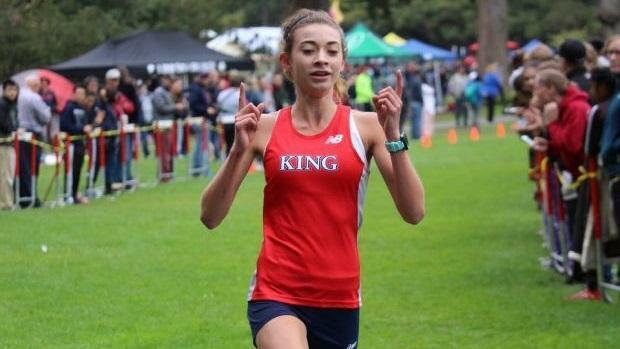 As if that wasn't impressive enough, she defeated one of the state's best runners in Niki Iyer (Harker) on the Golden Gate Park course Saturday. She also led her team to a 60 - 82 win over St. Francis (Mountain View) in the first of two varsity races, and we can't wait to see how they rank when the races are combined together later today. In the other Varsity Girls race, Rylee Bowen (Sonoma Academy) posted the top time of the meet by running 17:03.5, with Alize Hartke (Oakmont) coming through in 17:10.2. Granada dominated the team scores in that second race, winning 90 - 180 over Alameda. Not to be outdone, Kent Slaney (Palo Alto) had a massive season debut in the first Varsity Boys race, running 14:29.5 to win by 23 seconds over Granite Bay's Jake Ritter. It wasn't just Slaney, either - the whole Palo Alto team ran well, posting a score of 41 to beat M.L. King by 51 points. In the second Varsity Boys race, Eli Horwitz (Stuart Hall) won the second Varsity Boys race in 15:07.6, and Granada's boys joined their girls in taking home a dominating team win. The Matadors scored just 33 points, with Joseph A. Gregori in second with 121 points. Lowell Invitational Results - Coming Soon!